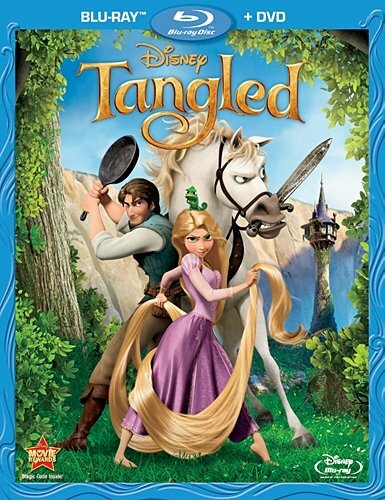 Disney's latest animated feature film, Tangled, is now out on Blu-ray, 3D Blu-ray, and DVD. My wife saw this film in 3D when it was in theaters, and I'd love to see how that compares to the home 3D Blu-ray, but unfortunately I don't have a 3D television or a 3D Blu-ray player, so that's not gonna happen anytime so. I don't even have a normal Blu-ray player yet! So even though I was sent a review copy of the Blu-ray/DVD version, out of that pack I was only able to actually watch the DVD. The good news is that even in 2D standard definition this movie is still a lot of fun. Actually, the only part of the movie I didn't care for was the very, very beginning where they give the background story. The narration and what we are shown don't quite match up. We see a drop of sunlight fall through the sky to the ground as the narrator says that a drop of sun fell to earth and from that drop grew a magic golden flower. So far so good. Then he continues to say that the flower could heal the sick and injured sickness, but what we see instead of this special ability is an old woman reaching out for the flower, so visually it seems like as soon as the flower grew this old woman found it and hid it away. Now obviously that's not the case, as people must have discovered it in order to know of it's power, but that's what we're shown. Then we're whisked away to a kingdom where king and queen are about to have their first child, but the queen gets very ill and everyone goes off looking for this lost magical flower. We flash back to the flower where the narrator the old woman, Mother Gothel, has been hording the flower all to herself for centuries to keep herself young, and all she has to do is sing a song to the flower. WTF? How'd she come up with that? I mean, it's cool that it works because then you don't have to pick anything off the flower or cook up any kind of potion, but if that's all you have to do for the flower to work then why bother hiding it? Anyway, so eventually the flower is uncovered by the immense search party, and is brought back to the king and queen. Once back in the castle, however, they don't do any signing. Instead, we see them place the flower, having been removed from the stem, into a bowl of water and the queen drinks it. Okay, so how'd they come up with this? Did they try singing and it didn't work? Did they try having her smell it and that didn't work? Did they try rubbing it on her body and that didn't work? How do they know what to do? So yeah, I was kinda bugged by that beginning stuff which didn't seem to make much sense to me. But from here on, it really improved. The queen had a beautiful baby girl, named Rapunzel, with amazing golden hair. Mother Gothel then sneaks into the castle and signs to Rapunzel and her golden hair lights up but when Mother Gothel cuts a lock off the lock turns brown, so instead Mother Gothel kidnaps Rapunzel and hides her away in a tower far from the castle.... though obviously not too far since it turns out to be within walking distance. I wondered why Mother Gothel didn't take her much further away, but then the area with the tower is quite hidden away and seems like a good secret spot. Anyway, the story then picks up when Rapunzel is a teenager and has really, really, REALLY long hair, and she's very good at using it for grabbing, swinging, hoisting, and all sorts of other purposes. Mother Gothel has been posing as Rapunzel's mother, and doesn't allow her to leave the tower. But Rapunzel's birthday is coming up, and she really wants to see the source of some mysterious lights that always appear on her birthday. Her mother absolutely forbids it, but thanks to a chance meeting with a thief named Flynn Rider to accidentally stumbles into Rapunzel's tower, she realizes this is an opportunity she can't pass up. So eventually the two leave the tower and head off on a quest to the see the lights. I love Rapunzel's personally. She's naive yet very strong-willed and passionate, and has conflicted feelings about leaving her tower and finding the source of the lights and disobeying her mother. Flynn, on the other hand, seems a little more 2-dimensional, as he's a charming, cocky thief who just plans on taking off as soon as he can. We've seen the type many times, but thankfully Zachary Levi does a great job of voicing the character, making him quite likable and complementing Rapunzel perfectly. I should also mention one other notable character, and that's Maximus, the horse that's chasing after Flynn, because Maximus is hilarious in his determination to find Flynn. The animation is beautiful and feels very natural, such as the way Rapunzel's dress moves or the water in the giant flood scene which I would sear was actual water, but beyond everything is Rapunzel's hair, which is spectacular, how it flows and moves and actually looks like hair. This movie looked great in 3D, but it definitely doesn't rely on 3D, as it looks just as fantastic in two dimensions. I think this is probably the best computer animation I've ever seen, and even though the characters aren't photo-realistic they are still extremely expressive, especially Rapunzel who is absolutely adorable. There are a few songs in this movie, and although I didn't find any of them catchy or anything I would be humming later on, they all fit nicely with the tone of the scenes. Definitely not a soundtrack I would buy, but the movie is definitely worth getting. The DVD only has two special features, two alternate openings and a 50th anniversary countdown, which is a quick rundown of every Disney animated feature starting with the first Snow White and going all the way up to number 50, Tangled. Each one gets about a two seconds of screentime of clips from the movie, and it's pretty cool to see how animation styles have changed between each of the films. There's also a few that I didn't recognize. The Blu-ray has more extra features, but for those all I can do is list 'em.